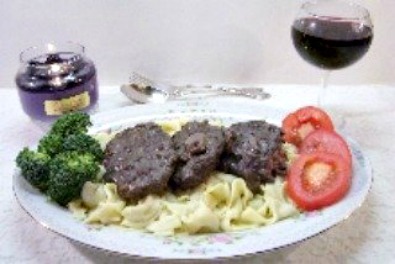 Beef Burgundy is an old fashioned recipe popular in the 60s and 70s made with ground beef or sirloin tips, mushrooms, carrots, onions, and Burgundy Wine. It was on the menu of many upscale restaurants. This recipe was given to me by the restaurant manager of a chain hotel. Her version contained beef tips, and carrots. She said the carrots were for looks and didn't add to flavor. Carrots enhance nutritional value, but prolong cooking time, so are not included. I serve lots of vegetables with this dish. I switched to less expensive, ground beef sirloin to save on food budget. Divide ground beef into 4 equal parts and shape into oblong patties. Place in a cold skillet with onions. Turn heat to medium and cook until browned on one side. Turn over and brown other side until there is no longer pink showing, when pierced with a fork. Add broth. Stir flour into water until smooth and pour into skillet. Add mushrooms, garlic and water. Add beef patties and cook until all is hot and bubbly. Serve hot over Homemade Noodles, rice, or mashed potatoes. Modify Beef Burgundy recipe for special occasions or when company is coming. Add tips and sear* on both sides until lightly browned. Remove from skillet and set aside. DO NOT DRAIN. Stir the flour into pan drippings until it is browned to the color you like your gravy. Slowly, stir in broth and water. Add onions, mushrooms, carrots, and garlic. Reduce heat and simmer until carrots are tender and gravy is thickened. Add tips back into pan. Add wine and simmer until the beef is done. To test for done, stick a fork into the meat. Check the inside to see if it is as done as you prefer. If it isn't, stir in a little more water and cook it until it is. *Beef tips are one of the most tender and tastiest of all cuts. Searing the meat first, seals in the juices, retaining this wonderful tenderness and flavor! For a memorable dinner, light some candles, and serve the Wine.